A feeding trial was conducted to evaluate the effect of linseed oil (LO) on growth, plasma biochemistry, hepatic metabolism enzymes, and antioxidant capacity of juvenile largemouth bass, Micropterus salmoides. Four isonitrogenous (crude protein, 45%) and isoenergetic (gross energy, 18 MJ/kg) diets were formulated by replacing 0 (the control), 33.3%, 66.7%, and 100% of fish oil with linseed oil. Each diet was fed to three replicate groups of fish (initial body weight, 22.02 ± 0.61 g) for 8 weeks. 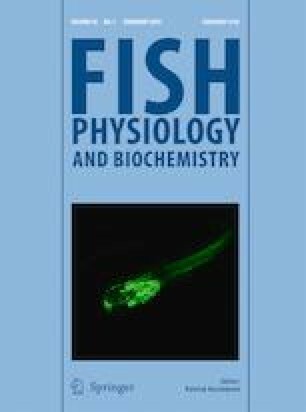 The results indicated that fish fed diet with 100% LO substitution level had lower weight gain (WG), specific growth rate (SGR), and protein efficiency ratio (PER) than the other groups (P < 0.05), while feed conversion ratio (FCR) was higher compared to the other groups (P < 0.05). Feed intake (FI) and hepatosomatic index (HSI) of 66.7% LO substitution level were significantly lower than the control groups (P < 0.05). Glycogen, lipid, and non-esterified fatty acid content in the liver decreased significantly with increasing dietary LO levels (P < 0.05). Moreover, the replacement of fish oil (FO) with LO could significantly reduce the content of triglyceride (TG) and total cholesterol (TC) and the activity of alanine amiotransferase (ALT) in plasma of M. salmoides (P < 0.05). There were significant differences in hepatic metabolism enzymes in fish fed diets with different dietary LO levels. Adenosine 5′-monophosphate (AMP)–activated protein kinase (AMPK) and peroxisome proliferator–activated receptor (PPAR-α) activities in liver significantly increased with increasing dietary LO level (P < 0.05). In addition, phosphoenolpyruvate carboxykinase (PEPCK) and fructose-1,6-bisphosphatase (FBPase) activities in the liver significantly increased with decreasing dietary LO level (P < 0.05). Both the lowest superoxide dismutase (SOD) and catalase (CAT) activities in the liver were recorded in the control group (P < 0.05). Moreover, nitric oxide content, glutathione peroxidase (GPx), and inducible nitric oxide synthase (iNOS) activities in the liver significantly increased with increasing dietary LO level, while malondialdehyde (MDA) content significantly reduced. These findings demonstrated that LO can improve liver function and antioxidant ability of M. salmoides. In addition, replacing partial FO with LO cannot affect growth performance, but all substitutions inhibit growth performance of M. salmoides. We thank Y. L. Zhou and Y. Jiang for their help during the experiment. Thanks are also due to M. M. Mou and M. Q. Song for helping with the chemical analysis. This research was supported by the National Natural Science Foundation of China (31672659), the Science and Technology Council of Chongqing, China (No.cstc2015jcyjA80027), Chongqing Ecological Fishery Technology System (2018-2019), China, and Fundamental Research Funds for the Central Universities (XDJK2018D007), China.